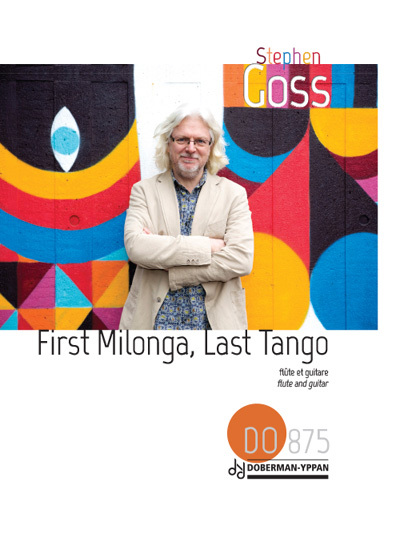 First Milonga, Last Tango is a pair of pieces for flute and guitar that pays homage to Astor Piazzolla. First Milonga was written as an elegy in the week following Piazzolla’s death in 1992; at bar 45, it refers directly to his Histoire du Tango. Last Tango, written ten years later, is the final piece in a series of tangos constructed using fragments of material from Piazzolla’s St. Louis en L’ile. Last Tango also draws on material by David Byrne. First Milonga, Last Tango was first performed by William Bennett and Jonathan Leathwood at the Guildford International Music Festival on 25th March 2003. The piece has been recorded by Anna Noakes and Richard Hand on the album First Milonga, Last Tango quartz music (QTZ2031 © 2005).